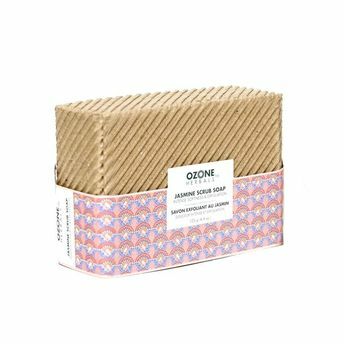 Ozone Herbals Jasmine Scrub Soap removes dead skin cells and impurities, to instantly brighten and rejuvenate skin. This detoxifying scrub soap keeps your skin moisturized throughout the day. It enhances blood microcirculation, purifies and resurfaces the skin, improves the skin's natural firmness, preventing the appearance of fine lines and the loss of elasticity in the skin. This invigorating Jasmine Scrub Soap restores skin's youthful suppleness and radiance- Lather, rinse and glow.